Used as a prayerbook as well as a book of hymns for church services, the psalter in the later middle ages was often produced with a calendar and additional prayers. Eventually it was combined with an abridged version of the breviary, the prayerbook used by monks, to form the special lay prayerbook, the book of hours. This psalter represents an important stage in this development as it took place in England. It is one of the earliest psalters to include the Hours of the Virgin, a special set of devotions taken from the breviary. Also it is the earliest of a line of richly decorated psalters which were probably made at Oxford, in the workshops by lay scribes and artists, an industry which grew out of book production for the university. 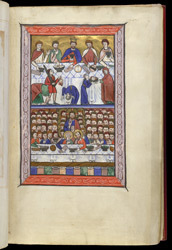 The book originally began with a series of scenes, two to a page, within an elaborate border. These would have been devotional aids to the book's reader, helping them to contemplate the life of Christ. The main events of the gospels are depicted chronologically, with no reference to the stories within the preaching of Christ, the parables. The story of John the Baptist's martyrdom is compressed into one scene, with two groups of figures before Herod's banquet table. To the left Salome dances while the decapitation takes place. To the right, Salome receives John the Baptist's head. Below a picture of the miracle of the loaves and fishes follows the sequence of the stories in the gospels.